Date: Feb 23 2019, 9:30 a.m. - 1:30 p.m.
Do you need motivation to save money and focus on your finances? Have you started to invest, but want to learn more? Are you ready to learn estate planning tools? Join us for the Wealth Building Seminar! Rheinland-Pfalz ACS has partnered with industry education foundation experts to bring you this great learning opportunity. Participants can choose from a variety of workshops. Couples can attend sparate learning tracks to gain maximum knowledge. 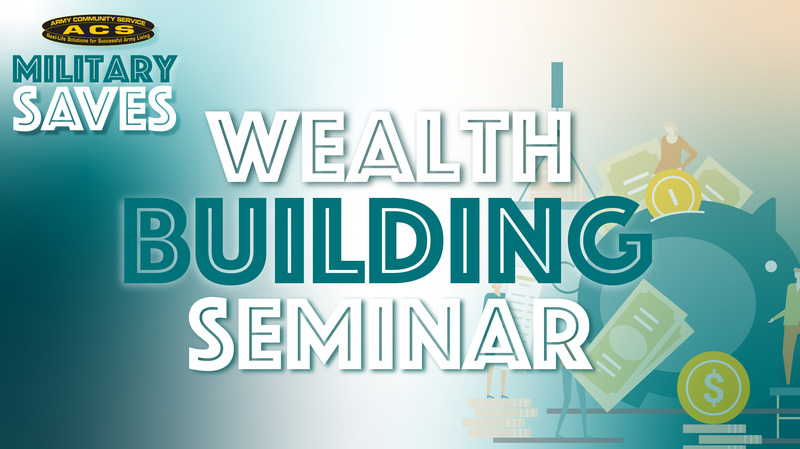 The Wealth Building Seminar will offer sessions such as Saving for Financial Security, Investing Fundamentals, Retirement Planning, VA Home Loan Process, and much more. This seminar is a part of the 2019 Military Saves Week campaign. This event is open to everyone and free childcare is provided, however, your child must be registered through Army CYS in advance. Childcare is provided off-site at Landstuhl CDC. Child care payment vouchers will be provided at the end of the seminar. Drop-off and Pick-up times will be provided in a confirmation notice. Please do not make reservations directly with the CDC; ACS personnel will provide confirmation. Seminar pre-registration is required if requesting free child care.